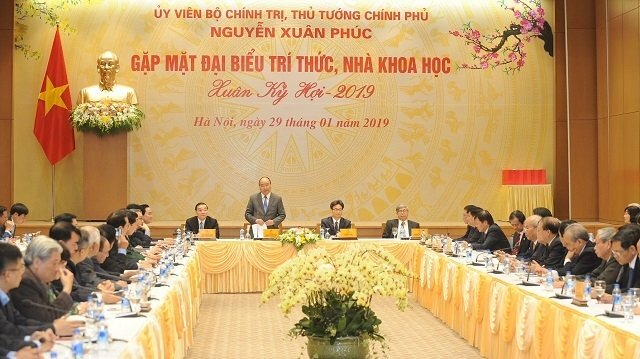 The Party and State highly value Vietnamese intellectuals and scientists, as well as their contributions to the national development, said Prime Minister Nguyen Xuan Phuc. During a meeting with 300 outstanding intellectuals and scientists from all over the country on January 29 in Hanoi ahead of the Tet (Lunar New Year) festival 2019, PM Phuc conveyed his gratitude to scientists for their great contributions, while stressing the importance of science and technology to the country’s development. He appreciated the opinions shared by participants at the meeting, saying that he will dedicate more time to listening to and holding dialogues with scientists on issues related to institutions and policy-making. The PM also expressed his joy at the strong development of the intellectual and scientist community. At the recent World Economic Forum (WEF) in Davos, Switzerland, Vietnam brought along a very strong message, demonstrating the country’s aspiration and determination to become a nation of innovation, with an economy that is deeply linked to the global financial system, Phuc said. He noted that Vietnam signed a cooperation agreement with WEF on building a technological revolution centre in Vietnam, which will be connected to other similar centres in the US, the EU, China, and India. The country aims to create acceleration in economic development and disaster prevention in the coming time, he said. The PM called on intellectuals and scientists, including those living abroad, to make more contributions towards national development, turning Vietnam into a high-income country in the future. He asked for more efforts in adapting to climate change; ensuring energy safety and security; and promoting healthcare, agriculture, and social science. Agreeing with the idea that in order to develop science and technology, it is necessary to have good institutions and laws, PM Phuc said the Government must work to fine-tune policies so as to develop not only innovative thinking but also financial policy, thus smoothing the way for increased sci-tech development and financial management.